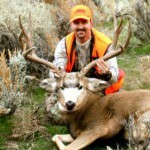 The 1999 general rifle deer hunt began in Southern Utah on a crisp chilly morning. Having never hunted this area before, I was clueless as to what to expect for bucks or even does for that matter. The day started out anything but desireable, as I wandered around aimlessly through sagebrush flats staring at old deer and elks tracks. I was quite unhappy as the opening day of the deer hunt was uneventful. At about ten o-clock in the morning I hadn’t seen hide or hair of a mule deer, let alone a forked horn. I then walked back to the truck as we tryed to find our fellow hunting buddies. I sat waiting by the dusty road and fell asleep dreaming of monster mulies hanging on my wall. After waisting the entrie first half of the day, I was reading to head to higher ground and do some intense hiking. We devised a plan to line starting at the top a ridge clear to the bottom.We would then drive the deer to a few of us sitting waiting to shoot. I had the highest part of the ridge, which of course was the best view. After about 1/4 of the way through our drive I heard a shot fired down the ridge below me, then a few minutes later a second shot. I sat waiting by the dusty road and fell asleep dreaming of monster mulies hanging on my wall. My heart rate began to climb as I knew there was at least one buck on the mountain. After hiking down to see the kill, my cousin Brandon had downed his first buck, a pretty 3-point. I then of course heading straight back up hill to finish our drive. About 1/2 hour later I heard another shot below. I never ventured below as I was to far up and the drive was almost finished. I was beginning to think that I was the only member of the party that would never see an antler. That’s when things got real interesting, real quick. I walked to the edge of a huge draw, where I simply could go no further as the ledge below was mighty steep. I sat down to rest my weary bones, after I was content I stood up walked out on rock overhanging the ledge. I sat staring at the beautiful scenery, when suddenly a bounding crash straight below me jolted my attention. I had told myself that I wouldn’t shoot at anything but a three point or bigger. At first glance I knew it was at least a 3-point, so I instantly dropped to the ground and fired. I simply had no time to think, and it’s a good thing because I usually take way to long to shoot, and the deer are gone. The buck gave me a running shot to my left as he headed down the draw. Upon shooting the buck disappeared, seconds later I heard a thunderous crash. I instantly knew the sound of crushing antlers, which brought excitement because I knew I had hit him, but also done some serious horn damage in the process. I sat waiting with another 130 grain 270 shell loaded to plug the buck again in he somehow managed to survive the fall into the steep wash. After about 15 minutes I figured the buck was surely dead, and dropped off the sheer rock wall to inspect the situation. Upon arriving at the kill site, I found the buck dead with his left antler entirely broken off at the base. The left side had 6 points, and the right side a straight 4-point. The bullet had entered the bucks neck, and most likely instanly paralyzed him, therefore, he fell about 15 feet straight down a big wash and slammed into a massive boulder, breaking the antler with ease. Of course my cousins, brothers, and dad were happy for me for the “lucky” shot and bagging my biggest muley yet. Althought the buck wasn’t very wide (19-20 inches), he did have the two kickers off the left side, decent mass, and great height.